In the summer of 2017, I finished building my dream Newborn Studio. My goal for this space was for new parents to have an immediate feeling of comfort, calm, and peace. I understand that sometimes it might be parents first trip from home, and it can be a little scary to venture out, as well as a little scary to trust your baby with someone you’ve never met. I get it, and I want you to know that you and your baby are in perfect hands with me. All you have to do is show up, and I will take care of everything else. My home studio is located in my daylight basement, and you will walk through our front door, and down some stairs to arrive in a 900 square foot area room. There are 2 big couches, a bathroom, a changing table, as well as water and snacks for your convenience. It is a cozy place, and I have caught parents taking a little snooze more than once :) I keep everything extremely clean and sanitized, and take very seriously the health and safety of newborns that arrive here. I have spent many years collecting only the best props and items for your sessions. I have learned what items work beautifully for babies, and more importantly, what don’t. So you can trust that anything you choose for your session will work perfect. Many parents just give me their colors and let me choose the setups, which is perfect too! Some props are used for certain poses. (ie. The bowls are used more for your curled up poses, and the boxes/bed are used more for above wrapped images). See my Poses section below for examples. 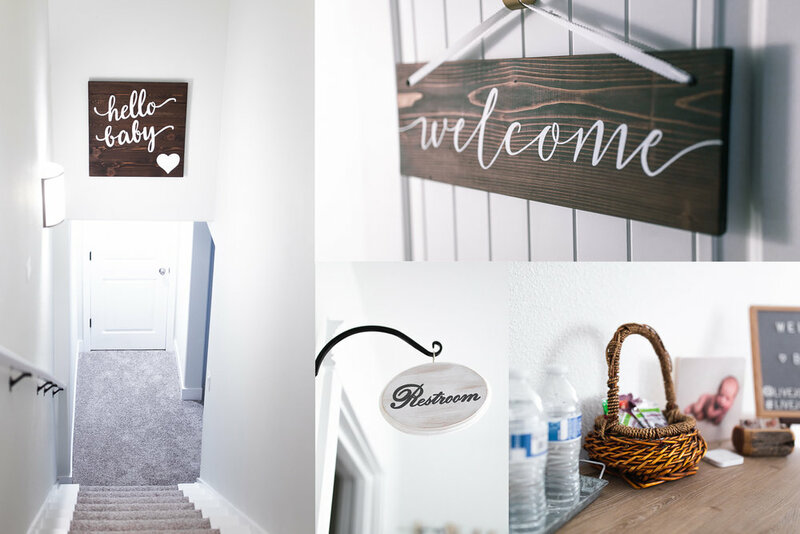 When you fill out your questionnaire, it will ask you if you have any preference on props/colors and that is where you can mention any of the items you see in these pictures! Family and sibling photos are so precious to get done. Not only for you, but also for your sweet baby to have as they grow up! I have siblings come just for the beginning of the session, and we do their photo with baby and any family/parent images first. Once we are done with sibling/family photos, I have siblings take off with family member or friend while we finish up the rest of the session with just baby. It is also worth mentioning that while I have a good track record with siblings images, and work very hard to achieve them, there is always the chance that they are uncooperative that day. More often then not, I am able to get the shot, but there is that chance! For toddler age, I typically have them lay down on my cream flokati and while I tuck baby next to them. This is something you can practice at home and that can be a big help to helping them feel comfortable. 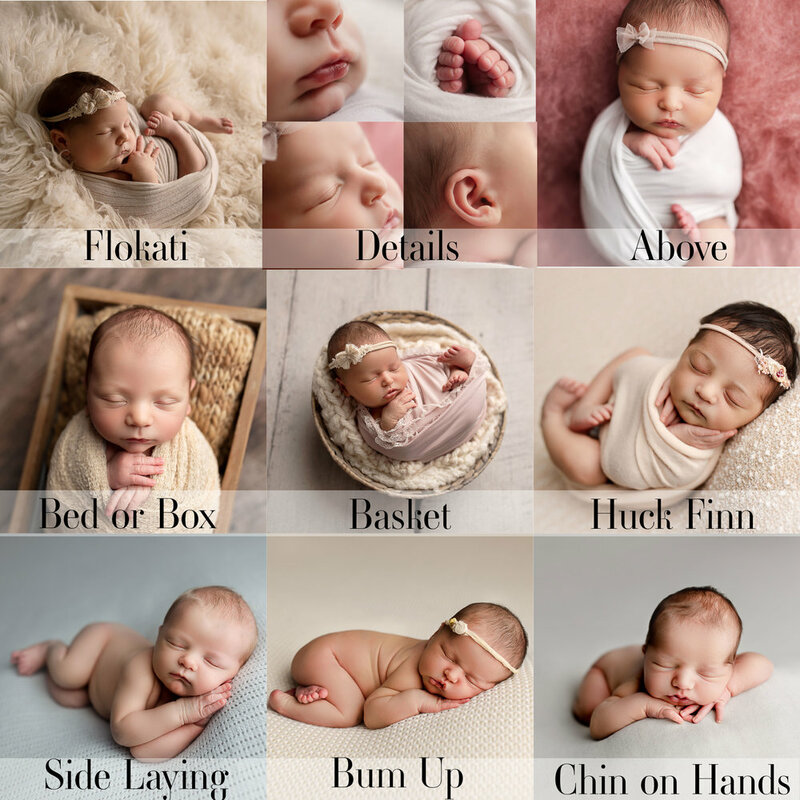 These are all the typical poses that you can expect of your little one during their Full Newborn session. However, I always like to mention that some babies are more comfortable than others in certain positions, and I will never force a baby into a position. So there’s a chance you may not get all of them exactly as shown. I spend a lot of time checking baby’s flexibility while I work with them to ensure their comfort/safely in each pose. I do a variety of images/angles from each pose, to ensure that you get all the sweet details. 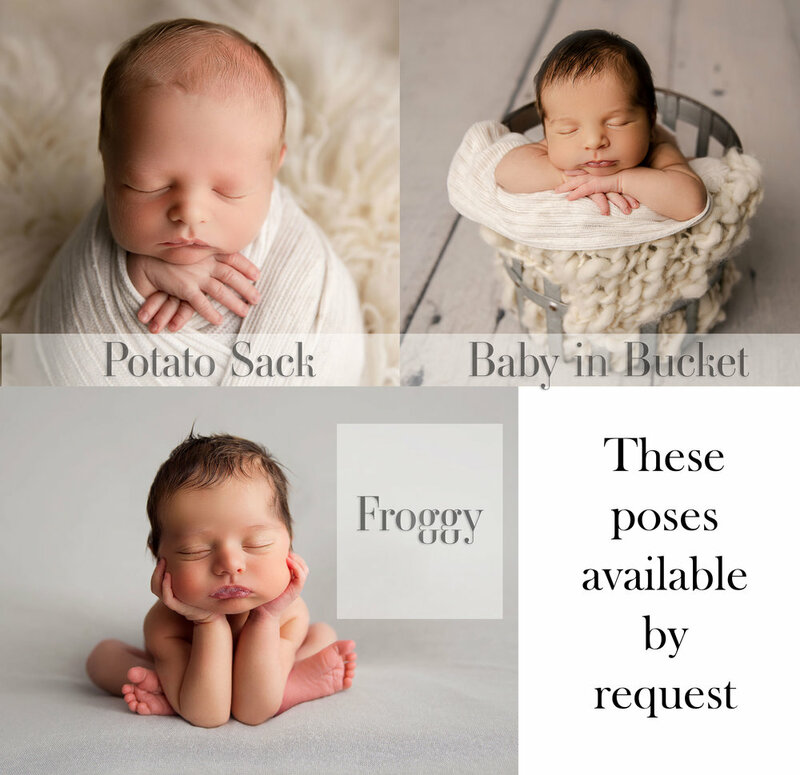 If there is a certain pose particularly important to you, make sure to let me know on your questionnaire and I will do my best to get that shot for you! The Second image is poses available by request. Approximately 2 weeks after your session, you will receive a private gallery of completely retouched images you may view from the comfort of your home. You select the number of digital files included in your package or you may purchase the whole gallery of images for $150. You may instantly download, share, and treasure your full resolution digital gallery of perfected portraits. Your gallery will be set up with a professional lab, and you will be able to order all your prints at a special 20% off! Every part of your session with me is completely prepared for, and thought-out in advance specifically for you and your baby’s comfort. It is such a gift and honor to welcome you into my beautiful studio.